Picture it: A romantic, candle-lit dinner with your Valentine by your side. You thought I was talking about that cute guy from the gym, right? Wrong. This Valentine’s day bae is a brand new bag – and StockX is here to set you up. If this bag’s good looks and charm (see what I did there) doesn’t win you over then what will? 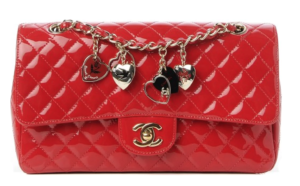 The iconic Chanel flap bag is the perfect way to treat yourself this Valentine’s Day. Featuring a vibrant red, quilted patent leather and gold-tone hardware, you’ll want a long-term relationship with this classic beaut. Sometimes love is all about practicality! 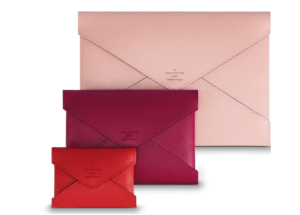 These Louis Vuitton Pochettes will always be there for you (and all of your necessities) for whatever it is you need, this trio is a triple threat. The largest size can fit an organizer for work or an Ipad, the medium pochette can fit an Iphone, and the smallest size can fit cash and credit cards. This Celine micro bag is so hot that you’ll totally get shy and awkward around it. 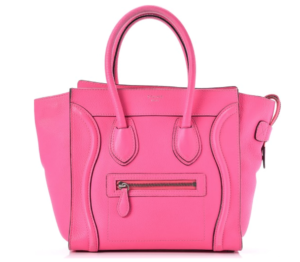 Featuring a bright pink drummed calfskin leather, this bag includes the iconic luggage Celine design. The design includes a gold-tone hardware and generous space inside for necessities. Barbie would def be jelly. Ah, yes. Go ahead, swoon over this one. 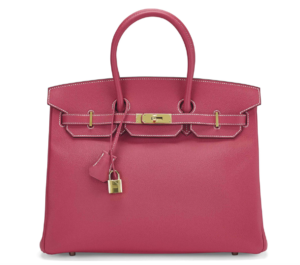 The infamous, drool-worthy Hermes Birkin, aka the Leonardo DiCaprio of all handbags, is every fashionista’s dream bag. This bag features a rose colored epsom leather and gold-tone hardware as well as a roomy interior for essentials. Like the old saying goes, history always repeats itself (hopefully this doesn’t apply to your ex this Valentine’s Day) this Louis Vuitton x Stephen Sprouse throwback is making its way back into the arms of Vintage lovers and collectors worldwide. Featuring a spray-painted electric pink LV logo against the classic monogram print, this bag will have you feeling like the real life heart eyes emoji. This Gucci Marmont belt bag will always be by your side. Once you get to know this velvety, fuchsia loveliness that is this bag you’ll be attached at the hip (by now you should know I live for corny puns) This belt bag features a zigzag design and “GG” gold pendant to make your heart skip a beat. If you’re a Titanic fan (sorry not sorry for all of the Leo references) you’ll “never let go” of this Louis Vuitton passport holder. 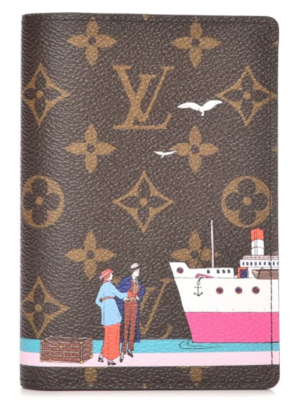 This cover features the iconic LV monogram in a coated canvas against a cute little romantic illustration of passengers boarding the ship. 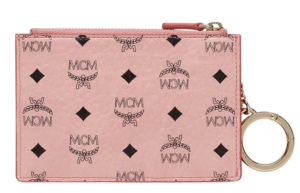 You know what MCM stands for right? “Man crush Monday,” of course. (just kidding) BUT we’re definitely crushing on this Visetos logo key pouch. Featuring a soft pink coated canvas and gold-tone hardware, this accessory is perfect for when you want to be low-key and carry just the essentials. Get red-y to turn heads in this cherry-coated cross-body. 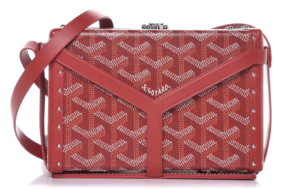 This bag features the iconic Goyard logo against a coated canvas and silver-tone hardware. 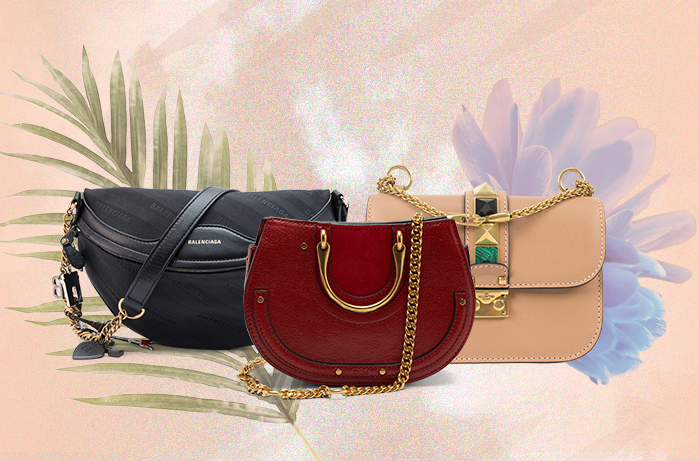 Who needs a box of chocolates when you can have a gorgeous box bag, am I right, ladies? 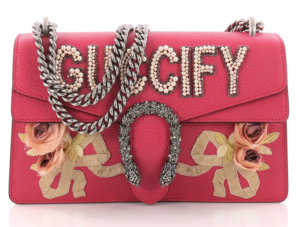 “Guccify” yourself with this beautifully embellished Gucci Dionysus handbag. With a rhinestone gunmetal snake pendant and hand stitched rosettes, you’ll want this bag to “be yours” this Valentine’s Day.